At Groningen’s cathedral of St. Joseph, all is set for the consecration of the fifth bishop of the Diocese of Groningen-Leeuwarden, at 11am today. The photo at left shows the cathedra, the bishop’s seat, with his new coat of arms applied (more on that below). Nine years after the last time a new bishop arrived, and 18 after it hosted the consecration of one, the cathedral will be filled to capacity. Attendance is by invitation only: last week the diocese already urged people who did not have an invitation to stay at home and watch the Mass on television (live broadcast is available via the NPO2 public channel, and will be available to stream later). Some 700 guests are expected, which means the cathedral is filled to capacity. 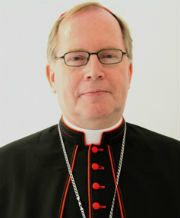 The bishop-elect, Msgr. Ron van den Hout has been in Groningen since last week and has already met with various groups of faithful on a private basis: the Saturday evening international student group and a diocesan youth gathering, to name two. In today’s Mass he will first be consecrated as a bishop, and then officially installed as the ordinary of his new see. Until that moment, the diocese is still without its bishop and under the leadership of the diocesan administrator, the former vicar general, Fr. 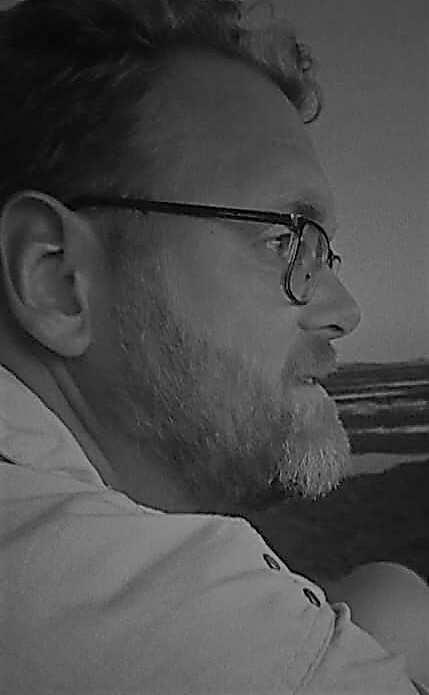 Peter Wellen. Consecrating the new bishop will be Wim Cardinal Eijk, archbishop of Utrecht and bishop of Groningen from 1999 to 2008, with Bishops Gerard de Korte and Rob Mutsaerts, respectively bishop and auxiliary bishop of ‘s-Hertogenbosch, serving as co-consecrators. Bishop de Korte was, of course, Msgr. 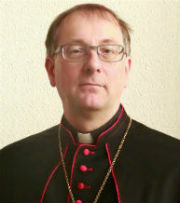 van den Hout predecessor in Groningen and the bishop under which he served as vicar general in ‘s-Hertogenbosch for a year. Part and parcel of being a bishop is choosing a coat of arms, and the one for the new bishop of Groningen-Leeuwarden was published a few days ago. Msgr. 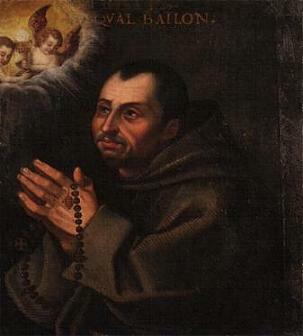 van den Hout’s personal coat of arms is placed on the diocesan gold cross on a green field. It features an anchor blooming into a tree at the top, with the tree referring to the bishop’s family name (Van den Hout means someting like ‘of the wood(s)’) as well as the shield of the city of ‘s-Hertogenbosch. The anchor is a symbol of hope, relating to the motto underneath: In exilio spes, hope in exile. Lastly, the tree also represents the man who trusts in God (Jeremiah 17:8). More on the ceremony later.